Modern Scientific Controversies Part 2: The Great Barrier Reef Wars | Watts Up With That? Prologue: This is the second in a series of several essays that will discuss ongoing scientific controversies, a specific type of which are often referred to in the science press and elsewhere as “Wars” – for instance, this essay covers the Great Barrier Reef Wars. The purpose of the series is to illuminate the similarities and differences involved in each. I apologize to all the Australian readers here – the version I write of this story is from my outsider-looking-in viewpoint which may very different than the story viewed from Down Under. Warning: This is not a short essay. Dig in when you have time to read a longer piece. “When marine scientist Peter Ridd suspected something was wrong with photographs being used to highlight the rapid decline of the Great Barrier Reef, he did what good scientists are supposed to do: he sent a team to check the facts. After attempting to blow the whistle on what he found — healthy corals — Professor Ridd was censured by James Cook University and threatened with the sack. After a formal investigation, Professor Ridd — a renowned campaigner for quality assurance over coral research from JCU’s Marine Geophysics Laboratory — was found guilty of “failing to act in a collegial way and in the academic spirit of the institution”. “Exclusive: All mentions of Australia were removed from the final version of a UNESCO report on climate change and world heritage sites after the Australian government objected on the grounds it could impact on tourism. [Photo caption] The Great Barrier Reef is in the midst of its worst crisis in recorded history. Unusually warm water has caused 93% of the reefs along the 2,300km site to experience bleaching. Every reference to Australia was scrubbed from the final version of a major UN report on climate change after the Australian government intervened, objecting that the information could harm tourism. “This report provides an overview of the increasing vulnerability of World Heritage sites to climate change impacts and the potential implications for and of global tourism. It also examines the close relationship between World Heritage and tourism, and how climate change is likely to exacerbate problems caused by unplanned tourism development and uncontrolled or poorly managed visitor access, as well as other threats and stresses. Tourism can also play a positive role in helping to secure the future of many World Heritage sites in a changing climate. The report itself was not written by UNESCO staff, but rather prepared for it by the Union of Concerned Scientists (UCS), an advocacy group originally organized to combat the nuclear arms race, but now a major campaigner for a broad range of energy issues and a major promoter of the consensus global warming/climate change world view, with a Board of Directors of impressive credentials, the vast majority of its members are everyday citizens. In fact the Lead Author of the report was Adam Markham, the deputy director of climate and energy with the Union of Concerned Scientists who previously directed the World Wildlife Fund’s climate campaign, leading WWF’s international climate team at the 1997 Kyoto Conference. The biggest threat to the GBR today, and to its ecosystems services, biodiversity, heritage values and tourism economy, is climate change, including warming sea temperatures, accelerating rates of sea level rise, changing weather patterns and ocean acidification. Coral reefs worldwide are being directly impacted by warming waters and ocean acidification, and climate change is exacerbating other localized stresses. Ocean acidification is occurring because of increased levels of carbon dioxide in the atmosphere. A significant portion of this CO2 is being absorbed by the oceans and the resulting increases in seawater acidity reduces the capacity of some marine life, such as corals, to build their calcium carbonate based skeletons. Significant drops in coral growth rate have been recorded in the last two decades for massive Porites corals on the Great Barrier Reef. Other significant threats to the reef include coastal development, agricultural run-off pollution, port-based shipping activities, illegal fishing and outbreaks of the coral-eating crown-of-thorns starfish. Assailed by multiple threats, the status of the GBR has been assessed as being poor and deteriorating. Half of its coral cover has been lost over the last three decades. Unusually high sea temperatures have caused nine mass coral bleaching events on the GBR since 1979, and until this year, the worst had been in 1998 and 2002 (Great Barrier Reef Marine Park Authority 2012, Steffen et al 2009, Hughes et al 2015). But higher water temperatures and a severe El Nino have been pushing corals into the danger zone all over the world in 2015-16, and the Great Barrier Reef is currently suffering the most severe bleaching episode ever recorded. “The World Heritage Centre initiated contact with the Department of the Environment in early 2016 for our views on aspects of this report. The department expressed concern that giving the report the title ‘Destinations at risk’ had the potential to cause considerable confusion. In particular, the world heritage committee had only six months earlier decided not to include the Great Barrier Reef on the in-danger list and commended Australia for the Reef 2050 Plan. These events in the GBR War have taken place this month, in the last couple of weeks. Salvo and response. Two of these stories have been reported here at WUWT: here and here. “Sydney (AFP) – Australia’s Great Barrier Reef is suffering its worst coral bleaching in recorded history with 93 percent of the World Heritage site affected, scientists said Wednesday, as they revealed the phenomenon is also hitting the other side of the country. “We’ve opted to release results ahead of final completion of surveys because of widespread misinterpretation of how much of the Reef has died,” he said. “Our aim is to bring the information from all scientific monitoring into a single picture in the coming months. “We’ve seen headlines stating that 93 per cent of the Reef is practically dead. We’ve also seen reports that 35 per cent, or even 50 per cent, of the entire Reef is now gone. “However, based on our combined results so far, the overall mortality is 22 per cent — and about 85 per cent of that die-off has occurred in the far north between the tip of Cape York and just north of Lizard Island, 250 kilometres north of Cairns. “The political debate and the release of the authority’s survey results highlights a growing conflict between the lead Barrier Reef agency and the National Coral Bleaching Taskforce headed by Terry Hughes. “Dr. Reichelt said the authority had withdrawn from a joint announcement on coral bleaching with Professor Hughes this week “because we didn’t think it told the whole story”. The taskforce said mass bleaching had killed 35 per cent of corals on the northern and central Great Barrier Reef. “Dr Reichelt said there had been widespread misinterpretation of how much of the reef had died. “We’ve seen headlines stating that 93 per cent of the reef is practically dead,” he said. “We’ve also seen reports that 35 per cent, or even 50 per cent, of the entire reef is now gone. We see that in just the first six months of this year alone, the Great Barrier Reef has been declared mostly dead and/or doomed by various sources, including a major government reef science group, the National Coral Bleaching Taskforce headed by Terry Hughes. The government agency with responsibility for the reef and the surrounding protective marine park, the Great Barrier Reef Marine Park Authority, cries foul, speaks of “deliberate sleight of hand” and misrepresentation and says simply that things are not nearly as bad as portrayed by activists. Our lead story, featuring Professor Peter Ridd, highlighted his personal attempts at holding the researchers involved in reef studies to a high standard of accuracy and transparency, whistleblowing what are clear (to him) examples of exaggeration and activism-in-place-of-science. He is rewarded by his University, which is also the host of the Terry Hughes’ National Coral Bleaching Taskforce, with censure for “failing to act in a collegial way and in the academic spirit of the institution”. James Cook University has not announced any intention of investigating charges of scientific misconduct – neither in response to Dr. Reichelt or Professor Ridd. As we saw in Part 1 of this series, The Salt Wars, on one side of the GBR Wars, we have a number of groups comprising scientists, government groups and agencies (Australian), UN agencies, and outright activist/advocacy groups – many having revolving door membership with one another – whose main message is something along the lines of “The Great Barrier Reef is now or will soon be ruined, a loss to all mankind, and it is the fault of the humans. Billions must be spent to ensure that it is protected and human activity, of various types depending on the voice, must be curtailed, including all burning of fossil fuels.” As is common with all science issues in which advocates see the need for urgent action – the we-must-DO-something approach – every adverse effect is framed as a serious threat that has led or will lead to calamity. As the GBR fight is deeply embedded in Australian national politics, the GBR Wars get dragged in a wide and dizzying variety of other local and regional issues. On the other hand, there are reef scientists and marine biologists like Peter Ridd; the calmer head of the GRBMP, Dr. Richard Reichelt; and a handful of Australian journalists critical of advocacy science. Primarily, this side of the War wants the data to be accurate, evidence-based, non-biased and truly representative of the actualities found across this vast natural ecosystem. This side riles against calamity-based advocacy reporting. None of these players are insisting that “all is well”…rather they try to lay out the challenges that face the reef, acknowledge those challenges which could be mitigated by changes in human practices and policies and focus on trying to understand the complex, complicated, intertwined biological system which created the reef over the last 15,000 years and generally accept that the GBR and its protection-by-policy under continued expansion and development of human society onshore represents a “wicked problem”. And then there are the scientists that study science itself, among them a group headed by Carlos M. Duarte, lead author of “Reconsidering Ocean Calamities” published in the journal BioScience December 2014. Overall, in Australia, the Great Barrier Reef issue is nearly always seen being used as a “political cudgel” – by both sides — something with which to hit “the other side” over the head in attempts to achieve some political/social/environmental goal. The green leaning advocacy groups use the threat of “threats to the GBR” in their attempts to stop development in Queensland (which adjoins the GBR), particular of the coal industry and Big Agriculture there. Environmental groups latch on to the “global warming causes high sea surface temperatures which bleach reefs” message to carry forward their political and social goals. Scuba diving associations straddle the fence—they want to “save the reef” but must admit, from personal experience, that it is in pretty good shape, albeit harmed by recent coral bleaching. This has been going on for years and years – all of the above occurs in a period of only three or four months, and represents a very small fraction of the thrust, parry, and counter-thrust in even that short time period. Every study or report about the reef is the subject of argument and controversy, the proffered facts are questioned and countered, opinions are presented as fact, fact claimed to be opinion and personalities are besmirched. 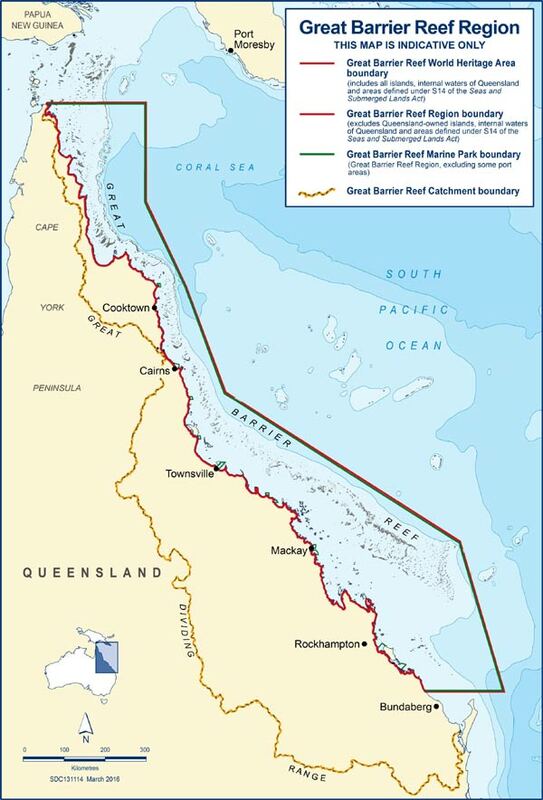 In the GBR Wars, we find a single government agency — the Great Barrier Reef Marine Park Authority – charged with the protection of a natural phenomenon the size of the US State of Vermont New Mexico which stretches approximately 2300 km along the coast of Queensland in north-eastern. The official map clearly shows the scope of the situation. What you can’t see here in this smaller version (click the link to see the original in a new tab or window) is that the GBR Marine Park boundary has little exclusion zones extending out from the harbors of the major population centers….had it not, every single action and decision regarding harbors, shipping, port development and the like would come under the scrutiny and regulations of the Marine Park. As it stands, those decisions and actions all have to take into account any and all possible effects on the marine park and the reef and local actions become “causes” – in short, simple things can become very complicated. Part of the Park Authority’s responsibility extends to the entire Catchment Area, the land area from which water flows to the same body of water, in this case the GBR Marine Park, giving the Authority an interest in activities on land as well as in the sea. As Australia attempts to manage and protect the reef, its scientists and scientific bodies carry on a seeming endless battle over even the basic facts concerning the condition of the reef and marine park – leaving policy makers and the public to 1) pick one or the other polarized viewpoints regardless of the facts or 2) scratch their heads in bewilderment, or 3) dismiss science and scientists are just another tool of politicians and advocacy groups. Naturally, the on-the-ground situation is much more complicated, with individuals and groups staking out positions and viewpoints spread across a broad spectrum of understandings and approaches. Australia has done a very commendable job in establishing the GBRMP, laying out reasonable and science-based long-term plans and goals and establishing monitoring mechanisms to judge progress and effectiveness. Even the sometimes-overzealous UNESCO acknowledged this and declined to list the GBR World Heritage Area as “in danger” (as an In-Danger listing would have been a huge embarrassment, the Australian government lobbied long and hard, and successfully, to avoid it). The Great Barrier Reef, and the surrounding protective Marine Park, covers an area of 344,400 km2 or 134,000 mi2, about the size of the State of Vermont New Mexico or the nation of Italy, stretching 2300 km/14,500 1,430 mi [h/t reader marchesarosa] from the north-eastern tip of the Australia continent south along its eastern shore, approximately the same distance as from Canada to Mexico along the western shore of the United States. Like all tropical reef systems, it is a complex mixture of life forms associated with calcifying corals and the structures they build over time forming a ridge of living coral, coral skeletons, and calcium carbonate deposits from other organisms such as calcareous algae, mollusks, and protozoans. Like all other coral reefs, the GBR is adversely affected by tropical cyclones which do physical damage to near-surface reefs, coral bleaching events, coral diseases, sedimentation from shore or surrounding sea beds, invasive species, disturbances caused by tourism, outbreaks of competitors or predators (such as the Crown of Thorns starfish, a major problem in some areas of the GBR), over-fishing and depletion of reef-beneficial species, destructive fishing practices (dynamite, cyanide, targeting species for the saltwater aquarium trade), pollution of various kinds and from various sources (mostly man-made) and ship collisions (any contact is physically destructive and serious collisions often cause local pollution – fuels, oils, and ship contents — and leave wrecks that over time become incorporated into the reefs and thus become tourist attractions). Some of these factors can be avoided, reduced, or mitigated by proper management policies. Some cannot. The establishment of the Great Barrier Reef Marine Park Authority and its associated bureaucracy, regulations, rules, long-term management plan and an effective system of monitoring the reef system represents an encouraging level of engagement by the Australian government. While many believe that global warming/climate change/ocean acidification will cause unavoidable irreparable damage to coral reef systems around the world, including the GBR, and while coral bleaching events are known to be caused by extreme sea surface water temperatures (such as those recently produced by the 2015-2016 El Niño), the science on the broader issues are subject to a great deal of uncertainty. The GBRMP covers not only the reefs, but the inshore waters and all their habitats and inhabitants – thus, like in Florida in the USA, there are concerns for sea grass beds, inshore fish species, marine turtles, marine mammals (whales, dolphins, and the dugong (Australia’s relative of Florida’s manatee) and rules and regulations established to protect them. From a longer perspective, it pays to remember that the reef has survived unrelenting storms, huge variations of weather and climate, naval battles, flood-born sedimentation and the myriad insults from invasive species, changing biotas and everything else Nature has thrown at it during its long history. Australian citizens overwhelming support preservation and management of the GRBMP – the devil, as the saying goes, is in the details. Facts, policies, and opinions surrounding the state of, the preservation of, the management of the Great Barrier Reef and the GRB Marine Park are a continuing feature of scientific and political controversy in Australia, with warring government agencies, academic bodies, individual scientists, politicians and political parties of all types and stripes, advocacy groups (social, environmental, political) vying for headlines in the overly cooperative Australian press and broadcast media, in which disaster, calamity, scandal and controversy in high places are the order of the day. Unlike some other modern science wars (the Salt Wars or the Climate Wars, for instance), there is no single policy remedy entrenched in the narrative of the “proponent” side, but rather a strident yet vague insistence that things are not going well, that a calamity looms, and that something drastic must be done at once — but what exactly that is depends on the group (out of many) speaking. Much of the current foment aligns with the anti-fossil-fuel/AGW policy demands, but anti-capitalism, anti-development, anti-coal, anti-Big-Agriculture, and other anti- groups get involved in the minutiae of GBR management and politics. There appears to be some scientific sloppiness – some White Hat bias, some Nobel Noble Cause bias, some publication bias, some bias deriving from social narratives – across the whole field of Reef Sciences, particularly in Australia itself. The overriding weirdness of the GBR Wars is that everyone wants the same thing – a healthy, productive, brilliant Great Barrier Reef system, and supports its protection and management – yet what we see from the outside are endless battles among those who should be working together towards this common goal. In the recent incidents highlighted in the beginning of this essay, we see one scientist call out a group of others for what appeared to him to be scientific misconduct at worst and widely biased reporting at best and he is ultimately censured by his University for it. The Australian government demands, and gets, that all mention of the GBR be withdrawn from a United Nations sponsored report, written for UNESCO by an acknowledged advocacy group with its own viewpoint to promulgate, fearing that the negative reporting would damage Australia’s tourist industry. The GBRMP authority, established by the government to protect and manage the GBR, withdraws from a planned joint statement regarding the recent coral bleaching event, originally to be issued by itself and the ARC Centre of Excellence for Coral Reef Studies at James Cook University, and publicly asks if the ARC study was based on “deliberate sleight of hand or lack of geographic knowledge”. The Australian people, their government, and the rest of the world are left mystified by the spectacle – unable to discover the true state of affairs concerning the GBR, which stands as one of the wonders of our natural world. This state of affairs is the unfortunate result of yet another science war – the Great Barrier Reef Wars. As always, I will be glad to answer your questions about the Great Barrier Reef Wars – which I have followed since the 1990s, when I returned to the Caribbean and experienced tropical reefs almost daily for ten years. I realize that many readers here will want to move on immediately to discuss the Climate Wars – one of the distinctive science wars of our day. The GBR War is tied by association with the Climate Wars, nonetheless, I ask again that you please try to restrain yourselves – we’ll get to that later on in the series. Many of you will already see parallels and similarities between the two science wars discussed so far. I encourage you to point them out in the comments. It is my intention that the last essay in the series will be an attempt to layout a coherent pattern of modern science wars and maybe suggest ways that the different science fields themselves can break these patterns and return their specific area of science back to the standards and practices that should exist in all scientific endeavors. June 20, 2016 in Alarmism, Bad science, Bad science journalism, Climate News, Environment, Ocean acidification, Sea Surface Temperature. The main damage is north of Cairns this time. Locals say that with the stagnant El Nino waters, there was not enough mixing of water to bring enough oxygen down to the polyps. Basically, the El Nino not only causes a drought on land but also at sea. In the south, using CSIRO figures, the run-off from agricultural areas, mainly extensive cattle grazing, is less than the soil rebuilds each year ( the danger of averages). However, the Reef needs run-off to bring in fresh nutrients. North of Cairns there is very little irrigation or farming. So farmers, the whipping horse of the greens, cannot be blamed for that section suffering the most damage. In the south, there is never mention of the dust that collects along towns and roads and that runs into stream with a little rain. That dust just lays as silt and only moves slowly along the river bottom and banks until a big flood flushes it out. Coal mining has increased the dust in the air for sure. Management of run-off from coal mines is a prickly subject so I won’t go there. Reef needs run-off to bring in fresh nutrients. Can you back that with anything but assertion? I read that coral exploited an nutrient poor environment where it had little competition. The problem with run-off is precisely that it bring in nutrients which allow of whole range of other species to establish which smother and push out the coral. Crown of Thorns is an example. Algae are another. As always the eco-lunes have to pervert every situation into AGW hysteria and thus end up diverting resources and attention from the real problems that need addressing. If we were not wasting hundreds of billions of dollar on pointless CO2 reduction strategies, we could solve poverty, health, education and a whole raft of REAL environmental issues. Reply to Jack ==> Correct. Major bleaching is well north of Cairns and totally unrelated to agriculture. There have been many claims and counter claims blaming Big Ag for reef problems, due to sediment and fertilizers washing into the near-shore waters via the rivers, especially after heavy rains (when it is not a drought, it rains). The issue of coal mining (at all….) and the ports for its export are huge public controversies and the GBR is used as ammunition in the fighting. I had thought there was research done a few years back that pointed out that run-off from non-agricultural land, in particular national park area was higher? On another note 85% of 22% is 18.7%… looks about 120% of the coral has died north from Lizard Island. I’d say even the ‘moderate’ view could fudge numbers, just that they know that the fanatical activists will make it harder to cry wolf. Walter Starck doesn’t seem to be quoted in your review. Been around the reef a while. He’s a refreshing burst of fresh air in the increasingly foetid air of climate debate in Australia. “How much of the total coral area of the GBR has bleached has not been assessed. Quadrant is a very good journal for sensible people. Reply to Another Ian and Michael Burke ==> Thank you both for the reference to Walter Starck — he is one of the longtime voices of reason in the GBR Wars. Those wishing to read deeper should follow the link provided to see his latest input. Kip, your “link provided” doesn’t link. Reply to Jeff ==> Thanks — Sorry — my comment writing tool is inserting empty anchor tags today….fixed now. 1. In geologic time, the modern GBR is a very recent phenomenon. It didn’t exist in its current location 20000 years ago because sea levels were something over 100 meters below current levels. It’s current location was largely high and dry. Since the GBR apparently followed sea level upwards 100 meters in 10000 years, that suggests that corals will expand quickly into suitable areas. i.e. If the seas warm dramatically, coral reefs may thin in the warmest waters, but will also likely expand poleward. 2. Coral bleaching is frequently equated to coral death. But as Jim Steele discussed here recently, coral bleaching due to temperature is caused by corals expelling their colored algal symbionts. In this case, the coral polyps are still alive and may well restock themselves over time with new — possibly different — symbionts. The mammalian equivalent (which we can’t do) might sort of be ejecting our gut bacteria in hopes the next bunch will be better suited our needs. 3. El Nino is, simplistically, a sloshing of warm surface water from the Western Pacific into the Eastern Pacific. It exposes Central and Eastern Pacific reefs to much warmer than usual water temperatures. Claims of El Nino related bleaching at Kiribati, Fiji, Hawaii (And Central America?) from the 2015-2016 El Nino seem quite credible. But the GBR is NOT in the Eastern Pacific. When, exactly did the elevated sea temperatures that triggered this purported bleaching event occur? How elevated were they? Don, look at the pattern of warm water in the Pacific during El Nino. It is generally shaped like an arrow for east to west. A hot ‘anomaly’ line across the equator and warm currents moving NE and SW from the west Pacific warm pool. With the mentioned sea level -100 meters from present, are there reef structures on the sea floor at those depths now, and a pattern of old reef growth as sea level rose? Steve. Good question. Damned if I know. Might have to drill cores to find out. The only coral island deep bore holes that I’m aware of were drilled at Eniwetok in the 1950s. They hit basalt after drilling through 1400 meters of lagoon and coral island sediments — thereby confirming Darwin’s conjecture that Pacific Atolls are probably slowly sinking volcanic island fringing reefs. 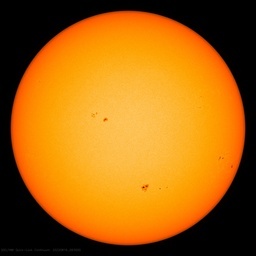 I have a lot of questions about all this having nothing much to do with AGW. For example, was there a GBR during the interglacial 120,000 years ago? What happened to it during the following glacial period? What was the geographic situation when sea levels started to rise 18000 years ago, etc, etc, etc? Bottom line: The Maldive Islands probably aren’t in trouble from sea level rise for the most part. Reply to Don K ==> “Norfolk, Virginia, OTOH …” The problem in Norfolk is really across the river, near the hospital and the neighborhood behind it. I have been there many times — anchored off the hospital in our sailboat. The neighborhood is built entirely on fill and the tides come in and go out, including under the houses (seeping through the rock fill) washing out the dirt and causing subsidence. The additional factor is that the entire Chesapeake area is subsiding at a measurable rate, in mm/year. (See NOAA CORS data). The two subsidence factors, added to the expected continuing generalized global absolute sea level rise (caused by the expansion of the seas due to warming from the last Ice Age and the recent Little Ice Age), account for the situation there. Reply to Don K ==> The latest survey of bleaching on the GBR is here, issued a week ago. NASA gives some info on the SSTs at the Earth Observatory site. KIp — I tried to follow your links and got nowhere mostly and in the case of the survey, eventually ended up with another browser tab pointing back to another copy of your article. I tried looking at the html and found an quite remarkable tangle of script that is beyond my ability or desire to untangle. May be a problem with my browser (Opera 12.16) … or not. Anyway, i actually did check satellite reported SSTs in the GBR area from time to time during the El Nino. I didn’t see any alarming high temps and my impression is that El Ninos usually don’t increase GBR water temps much if at all. But I didn’t monitor the temps on any scheduled basis, so maybe there was a period of strong warming that I missed. On the other hand, I wouldn’t reject our of hand the thesis that pretty much everyone is just making stuff up. So if anyone has some dates and numbers that I can check, I’d be interested in seeing them. Kip, Somewhat tangential, but it crossed my mind this weekend that this whole coral bleaching thing would be far simpler if we had good objective data on bleaching — like from satellite data. I spent an hour or two wandering around the Internet. What I think I found is. 1. There is currently no regular program of reef bleaching observation using satellite data. 2. It is probably possible to detect and quantify bleaching from satellite data. 3. But it would require regular high resolution imaging of reefs — which is not done routinely for cost reasons. Probably won’t happen any time soon. Reply to Don K ==> For reasons unknown, the links you tried to follow were there, but empty. I have re-added the links and they should work now. The link you provide may prove useful someday — today it supplies only satellite-based (mostly) sea surface temperatures. This may be able to predict bleaching events — but since we (humans) can not change sea surface temperature, it will not prevent bleaching. If you read all the links about bleaching surveys at GBRMPA’s site, and some of the criticism of surveys by other groups, you’ll begin to get the idea of how terrifically hard it is to measure “coral bleaching”. “Reply to Don K ==> For reasons unknown, the links you tried to follow were there, but empty.” Thanks Kip, my feeling was that I don’t want to live in a world where the original html was legal and worked. The GBR link works now and I assume the Earth Observatory link does also. re the difficulty of measuring coral bleaching, you don’t have to convince me. I read a couple of three papers and looked at some hi-res images of coral — Green Island on the GBR and Kiribati(one weird bunch of rock when seen from overhead incidentally). Detecting bleaching from arial/satellite imagery looks to me to be at least very difficult, maybe a lot harder than that. Not only that but distinguishing bleaching from other phenomenon and events may be no small problem. The method used for establishing mortality is rather controversial and was by ‘manta tows’ (towing divers behind a boat). The sampling count is quite low (at a rough count of I think) less than 90 reefs to 12/June/2016 out of the estimated 3,000 or so. The random distributions, including zero or low mortality close to high mortality reefs, require some explanations. Is it genetic? Is it caused by local unpredictable thermal poolings or other stagnations? Who knows? Reply to Bob Fernley-Jones ==> There is no doubt that there has been a serious and fairly wide-spread bleaching event, with the GBRMPA estimating an eventual mortality rate of 22% — meaning 22% of the bleached coral, I believe, will die. The remaining 78% of the bleached coral is expected to recover over the next few months. Yes, based on work primarily by AIMS, an estimated 22% mortality was reported by Dr Reichelt (Chairman of GBRMPA) but I was pointing out that the diver towing survey only checked about 3% of the reefs of which by counting the diamond markers on the map 0.8% were assessed at over 30% mortality (17) and 0.8% were unaffected (25). I can’t finger it at the moment but I recall that someone in authority said that we won’t know the outcome until around October. I mentioned some other things that suggest that the sample is arguably too small given the spatially erratic assessments, and a methodology that gives an impression that it may be rather subjective without closer (un-towed) examination. Another consideration is the pre-existing coral cover and the 600 odd hard and soft species with varying sensitivities to challenge. If that coral cover was high and if there is say a 50% loss (e.g. five sites in the far north) then the outcome may not be serious. However, if pre-existing cover was already relatively low then substantial loss would be more serious. Consider what has been described as stunning recovery from mass bleaching at Keppel Island after high localised mortality in 2006, or remote Scott Reef off WA about 80% loss in 1998 that had looked gloomy because of no nearby reefs to provide seeding (and how growth rates increased, attributed to reduced warfare and increased light exposure). Reply to bobfj ==> Your point is well taken — what they have done is a sampling and then extrapolation. It is really all they could do. The GBR, as you know, is vast, spread out, mostly underwater. Coral Bleaching is not like a forest fire — much easier to fly over a burned forest, photograph and eye-ball-guesstimate the percentage of vegetation kill. Coral reefs however are difficult to survey and even harder to quantify. The iconic photo of a Green Turtle swimming over a bed of bleached coral was taken at Heron Island Research Station in Feb 2016 — it is atypical. Very little bleaching occurred at Heron Island, but an XL Seaview Survey photographer found that patch and photographed it many times, with a diver, the turtle, and alone. All the photos were put in the public domain for use in news stories about bleaching. The turtle and bleached coral image has appeared in ~200 news stories since April. Coral Reefs are complicated and complex biological composites — however, despite our lack of understanding, they are survivors in the long-term game. Your example of viral use of the photograph at Heron Island is interesting. We found that climate change has dramatically increased the likelihood of very hot March months like that of 2016 in the Coral Sea. We estimate that there is at least a 175 times increase in likelihood of hot March months because of the human influence on the climate. Amongst other inconvenient facts, the ‘methods document’ models the Coral Sea BoM SST’s based on wrong foundations because there is empirical proof of no fit with 75% of the significant mass bleachings and one non-event (that “should have” occurred under the model’s ideation) on the GBR. Oh, and March is not the warmest SST month per long term averages at twelve sites on the GBR etcetera. A Google search today for=> “great barrier reef” “175 times more likely” =>revealed 3,750 hits covering some very obscure sites in the later pages, although slight word variations gave questionable counts. I’m in protracted correspondence with the five authors (+ others) who despite their launching of incorrect personal views into the Public Domain have shown no interest. Reply to bobfj ==> The same group is firing back at GBRMPA’s survey results and trying to trump them with “probabilities” (see anything by R. B. Brown from Duke University or Wm. M. Briggs on that silliness). Their assertions come under the heading “fun and mischief with statistics”. Its authors only want to fight the GBR Wars — but not with you and not privately — their is no gain for them in that. Only broad reach media or journals that will be cited (whether or not the study is bunk) are important to them. I have a short essay in the oven about the turtle & bleached coral image. It is simply a fact that you cannot believe the “Reports” from Professor Terry Hughes re the GBR. Yet the taxpayers foot the bill for these people at James Cook University. As mentioned in various publications, the characteristics of Global Warming science is that there is no science, merely taxpayer funded, opinionated, academic fiefdoms. Of course it doesnt really matter to the MSM whether its 22% 35% or 90% its all a downward spiral to disaster caused by human beings and the world should cut its fossil fuel usage to help save the reef – what a load of conceited twaddle – how about setting an example and stopping all coal sales to China…..hypocrites! 1. How much has the water around it warmed in the last 100, 50, 25 10 and 5 years?. 3. How does the absolute temperature compare with other reefs in other locations? Have they suffered similar problems?. 4. How does the temperature change compare with other reefs? Have they suffered similar problems? It is a simple fact the information coming out of James Cook University cannot be relied upon. The recent “report” by Professor Terry Hughes is an example of political bias swamping any scientific research. It is a tragedy that taxpayer funds end up supporting these useless academic fiefdoms. Reply to Gentle Tramp ==> Thank you for the link. Yes, reef systems suffering the least stress from other factors managed to survive better under conditions that cause beaching and death on highly stressed reefs. Reply to Jon ==> Thanks for the heads-up. Added a text link below the image. Any chance we could have this series of essays in PDF format? Reply to RT ==> Yes — working on it, Will add links to the pdfs here soon. You can be pretty sure that any academic body which has to call itself a “Centre of Excellence ” probably isn’t. You achieve excellence by your work not by the name you chose for an institution. When you start out with spin, it’s a good indication that you are not doing good science and you know you will not get called excellent if you don’t put it on your own letter head. Look at all the leading universities: Yale Harvard MIT ; Cambridge and Oxford in the UK. They don’t need call themselves “Cambridge University of Excellence”. Centre of Excellence usually means politically motivated science. There seems to be a lot of such centres in leftwing dominated Aussie campuses. In the summary, the area of the GBR is listed as about 134,000 square miles, which is then equated to the size of Vermont or Italy. What sticks out is Vermont, which is nowhere near that size (9,800 sq mi or so). Perhaps the state meant is Montana, whose area is about 145,000 square miles. Yes, but how many Olympic sized swimming pools is that? We know that the moronic population can not understand what a square mile is, despite that fact that they are all intimately familiar with the inside of an Olympic sized swimming pool. And length is measured in football fields. Hard for me to convert cause I don’t know how long a football field is. Or an Olympic swimming pool. I didn’t realize Vermont had grown to the size of Italy. Reply to jarthuroriginal and John M. Ware ==> That’s what I get for “lazy journalism”….the “size of Vermont” and “the size of Italy” are both taken from standard reports about the reef’s size….I should have fact checked that data before including it. I think the GBR is likely in a better overall shape due to the small amount of global warming over the last 150 years or so. Slightly warmer water, slight rise in sea level, slightly less cyclones. So what is all the kerfuffle about? There is the “ocean acidification ” meme again , I don’t know why we don’t call this out for the lie it is . 8.1 ph is not and never will be acidic , but as with all CAGW never let facts or truth get in the way of a good story . considerable expertize, Jennifer Marohasy, Robert Ellison and others. Just sayin’. It’s perverted playing with numbers establish a mindless political conclusion. Divide the GBR into a number of individual ‘reef’. Then see if there is ANY evidence at all of bleaching on any part of a particular ‘reef’. Then count the number of reefs that experience ANY bleaching , however limited and express as a percentage of the whole number of subdivided ‘reefs’. That way you can turn 22% of affected areas into an OMG ! 93% of reefs “affected”. Reply to beththeserf ==> The GBRMPA is conducting on-site surveys, with the latest results published as a map here with data up to last week. There are no “coast dwellers” along the northern Queensland coast. There are no coastal roads beyond the Daintree River, which is about 50km south of Cooktown, which is shown on the map of the Great Barrier Reef provided by Kip. Cooktown had a population of 2339 at the last census. There is only one other township north of Cooktown: Lockhart River, which had a population of about 640. Lizard Island, which is about 50km north of Cooktown, only has a small tourist resort. The main road in this region, the Cape York Peninsular Development Road, is unsealed north of Cooktown, and there are no bridges across the many rivers that cross this road. That makes it four-wheel drive only for 8 months of the year. During the wet season, this road is impassable. As you can probably imagine, this area of northern Queensland is remote and sparsely populated. So we are reliant on the survey information for our data. There are coast dwellers north of the Daintree river. There is a sealed road to Cape Tribulation which then turns into an unsealed road eventually meeting the road to Cooktown. This services the residents of the Daintree – of which there would easily be above 500, as well as many tourists staying temporarily. There are also numerous small settlements south of Cooktown. The peninsula development road is sealed in many sections, and is in no way 4WD for 8 months of the year. There’s also a couple of bridges too, admittedly very low, but definitely bridges. [Photo caption] The Great Barrier Reef is in the midst of its worst crisis in recorded history. Well a slight improvment on their usual attempts of “warmest EVAH” but they can’t help themselves and let facts get in the way of climate reporting. Human recorded history goes back as long as we have been recording things in writing: several thousand years. They then cite data going back to 1979. “The Great Barrier Reef is in the midst of its worst crisis in recorded history. Unusually warm water has caused 93% of the reefs along the 2,300km site to experience bleaching …’. That 93% figure has been trumpeted around the world, it ought to be tested in court under oath. People’s livelihoods are are stake. How much ‘unusually warm’? How determined to be ‘unusual’? What before and after measurements? Am I naive to think that the water along a 1500 mile long N-S feature (similar distance from Nova Scotia to Florida) is not going to be at a completely uniform temperature throughout? That there will be warmer bits and cooler bits? Do the ‘bleaching events’ correlate with the water temperature? If not, then how can ‘global warming’ be a significant factor? Why is there no Great Barrier Reef off Nova Scotia? Are the waters too warm? If warming is bad for corals, why do we only find barrier reefs in the warmest waters on earth? What next? global warming is making too hot for palm trees to survive? They are all marching towards the poles. How many great barrier reefs surround Antarctica? How many palm trees grow there? How many palm trees grow in Nova Scotia? Reply to Latimer Alder ==> There is no scientific question as to whether or not bleaching is caused by warmer-than-usual water temperatures. The extent of the bleaching, and the recovery times, the mortality rates, and species involved are variable and depend on location, species, general reef health, etc. Bleaching does not affect every single bit of living coral at any location, in some places, like Heron Island Research Center, where the picture of the turtle swimming over bleached coral was taken in Feb 2016, bleaching was minor and very “a bit here and a bit there”. The GBRMPA expects that 75% of the bleached coral will recover in a couple of months. ‘Bleaching occurs. We don’t know why’? I live close to the western shore of the Coral Sea. John Brewer Reef is about 70km north-east of my front door. I haven’t been out there for a while but I know several people who have been there recently, and none have reported anything out of the ordinary. This is patently untrue. There is a large group whose fervent wish is that the GBR is destroyed. All evidence that the reef is resilient is ignored or denied. Dynamite? Cyanide? I don’t think that is happening on the GBR. People would know, and would dob in the perpetrators. Ship collisions are very rare; since GPS navigation became widespread I recall only one incident of any significance. Bulk carriers are not permitted to navigate the inner reef area, and movements into and out of ports are controlled. When I was on the academic staff at James Cook University, the Department of Civil and Systems Engineering carried out extensive research on shipping activities in the reef area. As far as I know, the “Systems” part no longer exists. I personally doubt that “extreme sea surface temperatures” have occurred. 60% of the natural airflow reaching my place comes off the South Pacific Ocean. I have not noticed, or measured, any increase in airflow temperature where I am, and neither has anyone else. There is no coal mining occurring on the east side of the Dividing Range. There are very few extractive industries of any sort on the north-east coastal plains, apart from quarry and sand extraction activities for road-base and construction. All of these are strictly controlled. The soil type over much of the north-eastern coastal plain is “old alluvial” eg duplex soils. Heavy intractable clay in the wet season, and “bulldust” when it is dry. The natural potential for fine sediment run-off is huge. A great deal of progress has been made by river authorities and Landcare groups in limiting sediment run-off and nutrient loading. It is likely that this is much less than would have been occurring prior to colonial occupation. Given the propensity of rural lands to accumulate material at about 4 tonnes per hectare per annum, it would be unwise if not impossible to eradicate run-off entirely. Sediment run-off is beach. No run-off, no beaches. Generally agree, except all the coal mines in central Qld are in the Coral Sea catchment. Not that it really matters as they are so far upstream their sediment influence would be negligible. Even the proposed Adani mine in the Galliee basin is in the Burdekin catchment. The Dividing Range in much of Qld is more of a division between watersheds rather than any great natural feature. Reply to Martin Clark ==> I find your assertion that “There is a large group whose fervent wish is that the GBR is destroyed.” rather hard to believe. Have you actually ever met and talked to people there in Australia who actively campaign for the reefs destruction? If they exist, they certainly have kept quiet about it — no mention in any of the media. I lived there for six months, and never met anyone holding such a view. “Dynamite? Cyanide?” are fishing problems that happen on and to reefs elsewhere in the world and have long been banned in Australia. Ship/Reef collisions are vanishingly rare in the GBRMP since technological advances such as Vessel Traffic Services (VTS) (shore-based systems which provide everything from simple information messages to ships, such as the position of other traffic or meteorological hazard warnings, to extensive management of traffic within a port or waterway) There are always problems such as this: Cargo ship towed away from Great Barrier Reef after engine breaks down. Abbot Point, a coal shipping port, has been in your news very recently — with many groups raising a ruckus. ” … never met anyone holding such a view … ” Slight exaggeration on my part perhaps, but they are all too numerous these days. The doom-saying is now so prevalent it amounts to wish-fulfillment. They become excited, enervated, every time there is a bleaching event. I recall about four bleaching events in the 25 years I have lived here. Not much fuss for the earlier events, but the squawking was prominent this year and in 2011-2. The coal shipping has been going on for a while, but there is no sign it has produced a Blackhall Colliery (google it). When I lived near Blackhall in the 1970s people fished off the beach. The ruckus-makers overlook processes such as the importing of nickel ore through the GBR for 40 years, and the export of bulk molasses for decades. I cannot find the reference, but I recall reading that a molasses spill would be a lot worse than coal, similar to an oil spill. Reply to Martin Clark ==> You are perfectly correct about the number and volume of the Doom Sayers! Do they still farm sugar and make (and export) molasses in Queensland? You forgot to mention the REAL reason for all this furore, the money. They say $16Billion is needed to “save or coral”, enough said. Reply to A C Osborn ==> I just wish I understood what they think the money should be spent on…..despite my research, I could not find an explicit answer. For many years it has been apparent that global warming (manmade or otherwise) does not affect coral as much as other human activities. Marine biologists merely need to compare the pristine coral in Cuba to the degraded coral in Florida as well as the pristine coral reef of Western Australia versus the degraded coral of the GBR. In both cases the difference is basic conservation measures such as preventing fishing boats coming near and restricting access to tourists. The latter is important because it has been established that sun tan lotion causes bleaching. Clearly bleaching is also caused by strong el ninos but somehow it seems that once again the pristine coral of Cuba and Western Australia also avoided bleaching this time around. Hmmm….is there an honest scientist around that might bother to ponder why? … sun tan lotion causes bleaching. There has been minor incidences of bleaching off Western Australia’s North West coastline, something I have seen a few times in the last 20 years, however the Green activists here are running the scare as hard as anywhere else. Well, Peter Ridd has a history of support for climate sceptic issues and organisations – he didn’t come at this purely on the basis of putting forward new research: he has a ‘political’ viewpoint on this. I’m not saying that’s right or wrong – merely that he isn’t an independent/unaligned voice in this debate. Using only your own premise I would conclude the opposite, that Ridd did in fact “come at this purely on the basis of putting forward new research.” Because scepticism is at the heart of the practice of real science. Reply to Griff ==> That is the very nature of a science war — that is the GBR Wars — everyone has an opinion, everyone has a viewpoint — every soldier in the war is on some side or the other. If we could get the field back to “science-as-it-should-be-done” it wouldn’t be a war. Griff, just because he is sceptical of some ior all aspects of climate change science, which by the way is a scientifically healthy position to take, you think he is bringing politics to the table. Crooked thinking Griff – you’re assuming that CAGW is 100% proved and therefore any scepticism of it can only be for political purposes. One of those numbers is wrong. Neither is the state of Vermont equal in size to Italy. Reply to marchesarosa ==> One of those numbers IS wrong…the miles figure, with a transposed decimal. By weight, Coral is made of Carbon Dioxide, Calcium, and Oxygen in that order. Without Carbon Dioxide there would be no Great Barrier Reef. Of the billions of tons of GBR, fully 55% of the weight of the reef is CO2. Only 25% of the weight of the reef is Calcium, and the remaining 20% is Oxygen. In total 75% of the entire mass of the Great Barrier Reef was made from air. calcium carbonate is better known as limestone. You add limestone to your lawns and crops to reduce the acid levels in soil (neutralize the soil). Limestone (fossilized CO2) is also added to lakes to neutralize acid rain. However, in the wacky world of climate science, up means down and down means up. A somewhat Freudian spelling error–Nobel cause for Noble Cause. James Cook U trying for a Peace Prize? After all, Al Gore got one. Reply to Tom ==> Thanks — happy fingers. Dishon, Gal, et al. “A novel paleo-bleaching proxy using boron isotopes and high-resolution laser ablation to reconstruct coral bleaching events.” Biogeosciences 12.19 (2015): 5677-5687.
uses Boron isotopes to reconstruct past coral bleaching events, and finds two periods, 6000 and 11500 years ago when coral bleaching events where at least of the magnitude of the 20th-21st century ones. Is this some type of 6000 years cycle on sea surface temperature increases? Who represents the dive operators/tourist hotels/restaurants that primarily serve tourists for the GBR in Australia? Is it just the tourism agency or is there a commerce one? I want to hear what they have to say– because they should have the numbers to back up what they are seeing and hopefully the power to say to the alarmist–put up or shut up. I also want to hear what the dive operators have to say on the whole thing. This is their livelihood so they should know if there is a problem–where it is and how far it extends–if it exists at all. Trained scientists or not–successful operators pay attention because they aren’t going to take paying customers to a dead reef. So where are they in this whole debacle? They are the ones on the front lines so to speak–so they are the most knowledgeable in the field. Where is their voice? And one last–the censure of marine reef scientist over the alarmist claims by a marine biologist–lets just get out the rulers and measure shall we? Publish the results in the paper and let the public decide who has the bigger one. Seriously. Reply to Jenn Runion ==> The GBRMPA has a charge to see that the tourist industry — including the snorkeling and dive industry — is well served in the Park — and well regulated. Remember, almost all tourist activity to the reef includes getting into the water (some fly-overs). The GBR was removed from the UNESCO Heritage Sites in Danger booklet at the demand of the Australian government for fear it would adversely affect tourism to the reef. Ok gotcha. Kind of like it is here in the US–government agency is responsible for the regulation of the park–including tourists. What I’m wondering though is there a Department of Commerce that is involved as well? Kind of a check and balance. For example, there was talk about closing a reef to divers and tourists off the coast of S. Florida for conservation. However, once the hotels and dive operators got wind of it, they contacted the Department of Commerce and complained that the Department of Natural Resources was extending into their livelihood. They comply with the regulations of no anchors…etc, but closing off the entire park would be detrimental to them. The Department of Commerce took it up with the DNR and they reached a compromise on the situation that allowed the dive operations and hotels to still stay in business while certain parts of the reef were closed at different times. It wasn’t a flat out–nobody gets to dive here anymore which is what the conservationists wanted and it wasn’t a “everybody gets to go” thing which is what the hotels and operators wanted. The 2 departments worked together to find a compromise that fulfilled both avenues–just not to the extreme. While this was going on the Department of Tourism got involved too. Reply to Scott ==> You are absolutely right — I have been fighting this error all morning! Some early reference used Vermont, and I failed to Fact Check the data. “…The Great Barrier Reef is in the midst of its worst crisis in recorded history. Unusually warm water has caused 93% of the reefs along the 2,300km site to experience bleaching.” etc. Aren’t they worried that they will cook their golden goose? Once everyone thinks the GBR is dead, they sure won’t want to keep spending $$ on a lost cause. Reply to Jeff in Calgary ==> “Aren’t they worried that they will cook their golden goose?” Those who promote never-ending calamity are not being entirely rational, thus do not see the end game. Most problems that are as complex and complicated (yes, both) are not solved by throwing more money at them. Judith Curry has recently mentioned a new book, The Rightful Place of Science: Science on the Verge (available as an inexpensive eBook), which has an interesting take on this problem. It is not, however, for the faint of heart. The $16billion for fixing the GBR is supposed to have come from state government “modelling”, but no one seems to have produced a priced bill of quantities. Maybe it is the cost of putting shade cloth over the Reef that was suggested for the last bleach about 4 years ago? Or travelling from one end to the other manually recolonising every (temporarily) vacant stand with replacement polyps? Nah that would be hard work. More likely another load of conferences, extensive tour of the reef by the usual suspects in a floating hotels, over-priced and over-staffed publications etc. They would soon burn up $16b following their SOP. It’s a Dr Evil demand. One point on the “sunscreen kills coral reef” thing. I very much doubt that this is based on field tests. More likely tipping some sunscreen in an aquarium tank killed coral. Googling on growing coral in aquariums soon confirms that tipping almost anything in a coral aquarium that isn’t supposed to be there will kill coral. Some orals release poisons or have sweeping tentacles that kill or deter other corals. How many times can the Barrier reef be wiped out? It must be into its seventh life already like a cat. Thanks for reading and contributing the many interesting additional links to various salvos in this science war. And thanks for the corrections! I have embarrassed myself by failing to personally check a primary source for the comparative sizes of various political units — the State of Vermont is not nearly as big as the GBR — Italy is at least comparable. The bane of journalists (and scientists) – accepting the work of others as correct. The misplacement of a decimal in the conversion of km2 to mi2 was my own. I found it intriguing that there is seemingly less interest – judging by # of comments – in the GBR Wars than in the Salt Wars. I would appreciate further comments on which ongoing Science War you’d like to read about next.